Pavbhaji is a fast food dish native to Maharshtra and is most popular in Mumbai. Pavbhaji cosists of Bhaji (a thick potato,tomato,cauliflower,green peas,capsicum based curry) garnished with coriander, chopped onion and buttered baked pav. The origin of this is traced to the heyday of the textile mills in Mumbai. A vendor created this dish using items or parts of other dishes available on menu. Initially it remained the food of the mill-workers.With time the dish found its wa into restaurants and spread over other parts of the city. Such is the popularity of this dish. Easy to cook this has gain popularity as a snack. Coriander, Cumin, Cassia, Cassia Leaf, Chill, Fennel, Turmeric, Clove, Anistar, Black pepper, Black Cardamom, Dry Ginger, Dry Mango & Common salt. Receipe : Heat butter in a pan and add 2tsp finely chopped garlic and 2tsp finely chopped ginger. Fry until garlic turns slightly brown. Add 2 finely chopped onions and fry until transparent. Add 3 finely chopped tomatoes and 1 finely chopped capsicum and fry for 2 minutes. Add vegetables (2 boiled and mashed potatoes,1cup boiled french beans,1cup boiled carrots,1cup green peas). 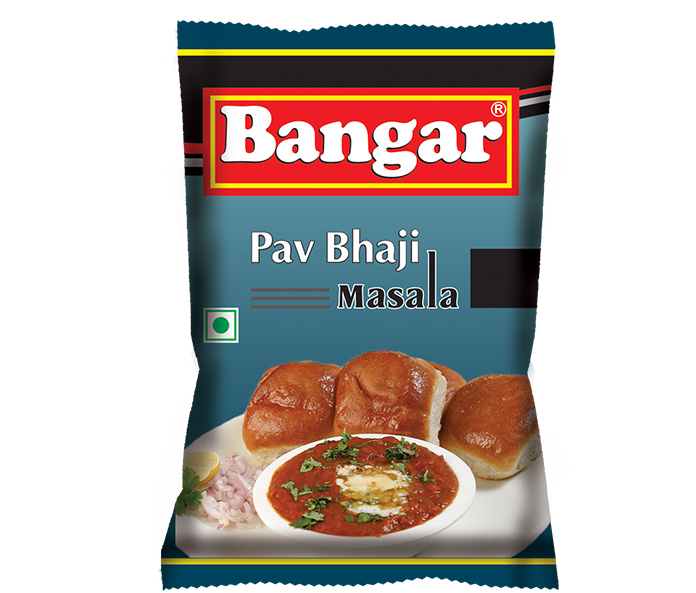 Add 2 tbsp Bangar Pav Bhaji Masala and salt (can also add red chilli powder for extra redness) and to taste and some water. Bring to boil. Remove from flame add coriander and butter. For PAV's - Slit pavs horizontally leaving one edge. Apply butter as desired and roast open on a griddle till hot and soft with the surface crisp on both sides. Serve hot with bhaji, a piece of lemon and finely chopped onion.